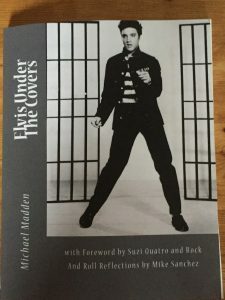 Just a quick update for now as I’m very busy with the launch of Elvis Under The Covers in August to coincide with the 40th anniversary of the death of Elvis Presley. Well, we might as well start there. The big news is that the foreword is being written by Suzi Quatro. Yes I know, unbelievable isn’t it? I emailed her for a quote, and she kindly responded saying if there was anything else she would be happy to help. So I asked, and she provided. She also wants a copy of the book, naturally enough, so she sent me her address too. Having watched her perform 48 Crash, Can The Can and Devil Gate Drive when I was an impressionable boy in the 1970s, I hope she wears that black leather suit when I deliver her copy! Of course, Mike Sanchez is still playing a prominent role, and he has provided his rock and roll reflections that have been included in full. 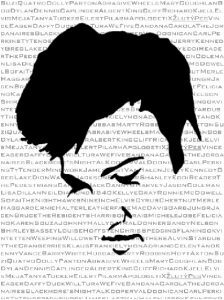 However, I was delighted by the range of artists who have also sent their quotes for the book. These include Queen Of Rockabilly Wanda Jackson, Country Music star Tanya Tucker, Eddi Reader, Chris Spedding, Danny B. Harvey, Stella Parton (Dolly’s sister), and loads more. Last Sunday I did an interview with Kenny Vance whose band opened the first American shows for The Beatles and The Rolling Stones. But it’s not all rock and roll! Today I have been working with my very talented artist and cover designer Hollie Crankshaw. The first physical copy of the book arrived earlier this week – containing a stock photo. Hollie is working on her own design with the names of some of the artists involved written across the image. Release date is set for 16th August – though there may be a copy or two available in advance if anyone wants to review it! Staying with the musical theme I am heading to Manchester later today for a Suits & Vinyl networking session. You are encouraged to take vinyl records along to this, so I have dug out my Eddie & The Falcons LP along with my Penetration luminous disc! Sometimes I don’t think Sally gets my sense of humour, as I have probably said before. A few days ago she called out from the bathroom, ‘What’s that ugly thing hanging up in here?’ Knowing full well that it was my toiletry bag that doesn’t match the curtains, tiles, toothbrushes or toilet seat, and that it certainly doesn’t have the words Jo Malone emblazoned expensively on the side, I said, ‘Its the mirror.’ That didn’t end well! Which brings me on to a bugbear of mine – cushions. Not settee cushions or seat cushions. I mean bedroom cushions. I sometimes have to remove as many as ten of them before getting in bed, and the next night there they are again. Even the cat won’t sit on them! So what are they for? Generally speaking there’s only Sally and myself that venture into the bedroom, unless Ole decides to hoover the whole house (only joking! ), and as 50% of us find them a huge inconvenience I really don’t see the point. I’ve taken to throwing them as far away from the bed as possible, but like a malevolent soft furnished boomerang they inevitably return. Any ideas lads? Zac is counting down the days until the summer holidays, and he now has a new way of evaluating how good a day or a lesson will be. Its all about the position and situation. The best position is the back row and the best situation is in the far corner! Apparently I am being lined up for some kind of food exchange. Louise sent Sally home with a baked egg custard last week, with the unspoken understanding that I would provide something in return! Sally could have made something, but Louise said no. She wanted paella or some such dish. 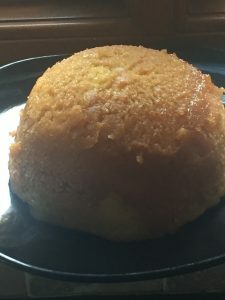 Anyway, I made a syrup sponge pudding but it all got eaten! Ole has gone to Zante with his mates. The day before departure he insisted on a trip to Tesco, and here he is later on packing for the trip. 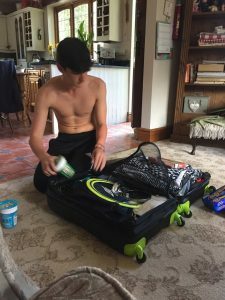 Yes – that is Pot Noodle that he is packing! He also stashed biscuits and pasta (including sauce), saving all of his hard earned cash for alcohol. He is away for his 18th birthday, which saves us a party, but not to worry as the mums have created their own Messenger group to ensure they keep each other up to date with any shenanigans. And here’s a word of warning – check the small print on your holiday insurance. Some insurers are now invalidating medical cover if you do not have an EH1C card. These are free – so if you haven’t got one or it has expired I would strongly advise getting an up to date one. Another word of warning – use the official site. These are FREE. Do NOT pay. A lot of scam sites will get you an EH1C, but they will charge you more than £30 for the privilege. And speaking of travel, Ryanair paid their compensation promptly after our Italy trip. Not so Expedia. Their refund hadn’t appeared so I contacted them. They rang me back and said due to a technical fault the payment had not gone through but they would see to it immediately. Two weeks later I called again. They said there had been a technical fault so the payment had not gone through but they would sort it out immediately. I then got an email stating it would take up to 15 days to process the payment. 15 DAYS! It took less time than that when we had to process cheques. Timberrrrrrrr could be heard in our garden after recent storms, with almost disastrous consequences. Sally called me out one evening to hold on to a tree whilst she chopped it down. It was about 20 feet high, and dangerously close to the fence which is about 10 feet from the railway line. She had already sawed quite a way through it, arguing that the storm damage would soon fell it anyway. I grabbed a rope to try to pull it back to our side of the fence, but to no avail. she sawed a bit more, and a loud crack was followed by the tree crashing onto the fence and beyond. I ran around the trampoline and climbed over the fence where the tree was across both rails of the adjacent Buxton to Manchester line. I pulled it back, but it would only bend rather than breaking, so I shouted to Sally. At that moment I was effectively holding a huge catapult a couple of feet away from a railway track. Sally climbed over the fence to finish her sawing at just the same moment that a train went past. Literally 30 seconds earlier and I would have had to ensure that the railway police knew that it was Sally that caused the derailment and not me! ‘Gary’s got a great big horn,’ Sally said one day as we were driving to Macclesfield. There was no lead up to this, in fact very little conversation at all up to that point. I looked at her in puzzlement. She pointed out of the window. ‘That house over there looks like the one that Gary is doing up at the moment, and I remember speaking to him the other day. He told me he’d got a great big horn that cost £15,000.’ These unspoken connections rattled around her head in perfect and full conversation, unfortunately it was only the last sentence that I received and yet I was fully expected to respond and join in. Anyone else get this? Sunday lunch at the Bull I Thorn last weekend – only because the Royal Oak was full. We didn’t know there was a VW rally on at the time, and they didn’t tell us when we rang to book the table, but no matter! We walked in and there was a queue a the bar which is not surprising as everything is done through the bar. We were pointed at a table and in the direction of the menus, then I ordered drinks. These were served in plastic glasses because of the festival, even though we were clearly sitting down at a pre-booked table. After two requests Sally got hers transferred to a proper glass, much to the embarrassment of Ole and Zac, and when the queue at the bar finally died down I ordered food. Zac’s sausage and chips were ok, nothing better than that. Ole loved his Steak & Ale pie with chips and peas. Sally and I both ordered roast beef dinners and they were great. Plenty of meat, new and roast potatoes, and vegetables served separately. A Yorkshire pudding was included, as was stuffing, something I wouldn’t normally associate with beef! Anyway, the stuffing wasn’t that good so we left it, but the rest of the meal was certainly worth an 8 out of 10. Probably won’t go back, especially if there is a festival on! An odd conversation occurred the other night when we talking about horseshit. Apparently there’s no law for horse owners to pick up their horses’s crap as there is for dogs. One horse owner sat looking at her steed’s steaming pile and said, ‘It won’t do you any harm. Horses are vegetarians.’ Anyway, Amanda, a vegetarian friend, replied, ‘Just like me!’ in answer to the horse poo problem. I am not quite sure what she was suggesting! Having fallen in a slurry pit as a kid I can assure you that the vegetarian nature of the beast does not make an experience like this any more pleasant! And whilst on the subject of horses, apparently horse air bags are a thing. The rider connects them up when they get on, and must remember to disconnect them before they get off, otherwise….